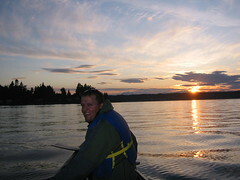 Our friend Lucas Larsen is here from Montana trying to land a teaching job in the Puget Sound. He was a student teacher in our class a couple of years ago. He has been teaching in Rapelje, Montana for the last couple of years. He and his wife, Amy would like to relocate to western Washington. We are trying to get Lucas employed in South Kitsap. Esther has been working on her boss at Orchard Heights Elementary to hire him. He has an interview on Tuesday, so please pray. We enjoyed a short canoe ride this evening. We have had a couple of busy days with Brad and Sandy Widstrom here for two nights. They are here to pick up their daughter from SPU and bring her back home to Denver. Last night we had several friends over to see them. Check out the Flickr photos. I am busy preparing for the Neah Bay trip this weekend.